It occurred to me about halfway through my recent candy-making spree that I was going to want something to nibble on that wasn't just a wad of sugar and butter. Fortunately these lentil snacks are still delicious. Also, look at all those comments! People used to stumble across this place by accident. Amazing. It is a pity that all my site-moving antics mean that I have utterly lost the meager Google position I once had. Oh well -- no one's fault but my own, to be sure. This version was truly a cultural mishmash, but still excellent. As the commenters on that old post observed, this is a very forgiving recipe. There was no tarragon, fresh or dried, in the house, and none of that Hungarian red pepper paste either. I left out the fresh herb component altogether and used about 3/4 teaspoon of pre-made Thai red curry paste in place of the Hungarian stuff. I was also too lazy to form the traditional little ovals you see pictured in the original post. Instead I used a little scoop made for portioning out cookie dough, which had the additional advantage of leaving my hands clean. I may have mentioned that I am fond of beans. Usually when I post bean recipes, I link to Rancho Gordo's instructions for making a basic pot of beans. There is not a thing wrong with those instructions. They are reliable, simple, and good. Lately, though, I've been doing something slightly different for my "basic" beans -- the beans that stand on their own but still feel like just plain beans, in a bowl beside some cornbread or tortillas, or alongside a plate of enchiladas, the ones I bring to a potluck when my friend F. warns, "No fancy stuff, now." Usually beans of this sort would involve some pork, but they don't need it, which is fortunate for our vegetarian selves. Sometimes I add some Bragg's Liquid Amino, which if F. knew about it, she'd definitely class as "fancy stuff." It just adds a little umami, though, and doesn't make things taste any less traditional, I promise. It is also fully optional. The secret, crucial ingredient is jalepeño brine. It does a magical delicious something without disrupting the essential Big Pot of Plain Beans quality of the thing. Try it and see! Many recipes for green beans exhort you not to overcook them, lest you lose their lovely crunch and bright green color. It is true that a lightly cooked green bean is a delightsome thing and that a middlingly cooked green bean is generally less so. A number of delicious recipes from Paula Wolfert, however, have convinced me that cooking green beans for a long time is also a good idea. I suppose that green beans are like squid in this way. Cook them quickly or stew them forever; in between lies sadness. I have noticed that Wolfert often speaks of long-cooked green beans as "putty colored," perhaps as a scheme to preempt confusion and disappointment. These, inspired heavily by a recipe in her book The Cooking of the Eastern Mediterranean, are not quite that far gone. Though I have made them several times, I have perhaps not yet ever truly cooked them long enough. Even so, they will not be winning any contests for vividness or crunch. They have other qualities to recommend them. The yogurt (which I add later than the original recipe suggests, because I found that I had trouble with curdling when I made it as written) makes a luscious sauce. Saffron is not commonly paired with the humble green bean. That gives this dish a little thrill of the not-ordinary, and in fact the combination works very well. These are served at room temperature, which is nice because you can make them ahead and pull them out as an accompaniment to a simple light supper or hot lunch, an omelet for example. From the archives. These are tasty, absurdly easy, and low on the glycemic index, so you won't be ravenous again at ten. I always think that they'll be too weird to appeal to other people, since most of us are not at our most adventuresome at breakfast time, but history has proved me wrong. Maybe you will like them too. Originally posted in September 2004. We like savory breakfasts in these parts, but are not remotely capable of making a hot breakfast on weekdays. Omelettes and the like are lovely on Saturday mornings, but require too much coordination for Tuesdays. So there are a couple of dishes I've developed that I can make very easily in bulk, and which dress up quickly and appetizingly in the morning. One of them is what we call "breakfast lentils." Here you see them with yogurt, red onion, and lightly pickled cucumber. Nearly all my bean cookery takes place entirely on the stovetop and at the counter. Soup, stew, chili, refritos, salad, a plate of just-plain beans, and even my "baked beans," which I hope to write about soon, never see the inside of an oven. However, every once in a while I do things the other way. Half an hour of baking, bathed in tomato sauce and plenty of olive oil, produces a bean dish I like very much. It's not quite the same as what you would get if you simmered the same beans in the same tomatoes for the same amount of time on top of the stove; the undisturbed gentle, dry heating in a shallow dish ensures that every bean retains its integrity, while the sauce cooks down into a lovely dense evenly clinging coat for each one. I recently received a fresh order of beans from Rancho Gordo, including two bags of the pretty-in-pink Flor de Junio. They are a medium-sized pink bean with a somewhat pinto-ish shape and a lovely smooth, creamy texture. Steve Sando, the owner of Rancho Gordo, warns that they don't age well, which makes this fresh supply feels like a special treat. These were harvested less than two months ago, sometime in July, and should be cooked before next summer--but I'm sure they won't last the month. Being so fresh, they cooked up quickly, from their overnight soaking to tender in about half an hour flat. I've been spending a lot of time working instead of cooking, lately, and have been doing both (as you can see) far more often than I've been writing about what I've been cooking. I know! What foolishness. What I have been cooking all this time has frequently and prominently featured beans. Lovely, gorgeous Rancho Gordo beans, decadently shipped to me from two-thirds of the way across the country. If you read other food blogs, you've probably already read someone else enthusing about these beans. Now here I am to do more of the same. It turns out that there are many advantages to making beautiful fresh dried heirloom beans. Of course they are delicious, and it's neat to become attuned to the differences among such a host of different varieties. Because they're fresh, they cook consistently (so you don't have some beans turning mushy while others remain hard). They turn out plump and attractive and whole instead of broken and sad. But there's also an interesting psychological advantage, for me, at least: the fact that the beans are an ingredient that I went to some trouble to get, and that I know were chosen and harvested with real enthusiasm, means that it feels like a treat instead of laziness to put them at the center of a meal. So that's what I've been doing. I just cooked up the last of our runner cannellini, which sadly are also the last to be had from Rancho Gordo by mail until new supplies appear, presumably after the harvest and drying are done, but you can still get them from Purcell Mountain Farms and Seed Savers--a very cool institution, by the way--and no doubt other places, too. (I've never ordered beans from either of these places; does anyone reading this have experience with their beans?) Runner cannellini are a magnificently gigantic and velvety white bean. Today they cooked perfectly in just one hour flat, after an overnight soak. Then I did this with them, which is exactly what I did with the last batch, because it is very very good. Recommended. A few of my favorite varieties are sold out for the season (no doubt helped out the door by the publication of Steve Sando's new cookbook). Not yet gone is my very favorite, though, the Eye of the Goat, which is dense and flavorful, and holds its shape beautifully despite having a relatively delicate skin. I love to eat them just in a bowl, topped with chopped red onions, a little cheese, a sliced avocado, a drizzle of oil and a squeeze of lime. A lot of the time, I buy more of a given ingredient than gets used up in a single dinner for two. That's fine -- we like leftovers, and also I've finally noticed that it's a good idea to cook a lot of foods from the same culture, or inspired by the same cookbook, in a given week or two. After I made the salad pictured below, we still had more ripe avocados, more radicchio, and more cilantro and onions and serrano peppers. So last night I made a sort of black bean tostada arrangement, but where crispy tortilla would go, we had grilled (broiled, actually) radicchio. It was great, and while it was in the same taste family as the salad, it was different enough to keep things lively. Any meal with this much radicchio really is only for those who like the taste of bitter things. But the black beans are mild and creamy, as of course is the avocado, so there is considerable balance for that bitterness. The arrangement was a bed of freshly cooked radicchio; then black beans heated through with some salt, olive oil, and cumin; then lots of sliced avocado; then the same vinegared onion as last time; then a minced mixture of cilantro, serrano pepper, and a small clove of garlic; then feta cheese and a drizzle of oil. For the radicchio, I turned the broiler on and oiled a baking dish. Then I cut the radicchio into substantial chunks -- eighths, maybe? -- and put them in the dish, letting the pieces fall apart where they liked. I gave them a sprinkle of salt and a quick brush of olive oil, and popped them under the broiler for what turned out to be 7 minutes, until the outer leaves were getting brown and crispy, while the inner parts of each piece were still warmed through and juicy. Happy New Year! Lentils and greens. To be traditional for New Year's Day, we had lentils and greens for dinner, and while it doesn't sound all that exciting, it was actually outrageously delicious. The lentils were tiny Umbrian ones, with slow-cooked onions and red peppers and plenty of olive oil, ground pepper, and a splash of good sherry vinegar. The greens were mixed spinach and kale, with garlic and again not shy with the olive oil. The results were surprisingly pretty -- the red pepper made the lentils an attractive golden brown that looked very nice against the dark green of the greens -- and very good to eat. I should have taken a photo, but it just smelled too good to wait. We ate every scrap. It's hardly a recipe, but the description above should give you the general idea, should you (or I) want to reproduce it. Just between us, I also included a tiny pinch of MSG in the lentils. I'd do it again, too! I notice that this is yet another entry in the growing list of roughage-laden, post-feasting meals I've been posting about a lot lately. We've just been out of town for well over a week, and the last four days of that featured nothing but hotel and restaurant food. It was generally very good, but I have a hard time resisting the siren call of fried-by-someone-else options, even though I know full well that I will be left feeling something like a lump of suet. Almost as soon as we were unpacked, I went to the grocery store and piled my cart with all the dark green and orange vegetables I could get my hands on. It makes me feel secure to know the house is well supplied. I think I'll start a spa! Roughisch Baden, we could call it. Eggplant and split red lentils (masoor dal) make a delicious combination. We had this for dinner tonight, using some eggplant that I had conveniently roasted earlier in the week and set aside for just such a use. We were too hungry and greedy to take pictures of the final dish before we ate it, and it wasn't the most photogenic dinner of all time, in any case, but believe me when I tell you that it was beautiful to us. 1. Preheat oven to 400 degrees F. Cut eggplant into cubes of about 1" or a little smaller. Toss in olive oil, sprinkle with salt and roast, turning occasionally, until golden brown and collapsing, as in the picture. This may take something like 45 minutes, though I confess I didn't keep track. Remove from oven and set aside, or even refrigerate for a few days. 2. Heat a splash of oil in a pan with a teaspoon each of mustard seeds, cumin seeds, and whole coriander seeds until the seeds begin to crackle. Add one small onion, minced, and cook over medium-high heat for a few minutes, until the onion has softened. 3. Add half a teaspoon of ground cumin and a quarter teaspoon apiece of tumeric and cayenne (adjust to your tastes). Cook just a moment, then add 3/4 cup of red lentils, a quarter teaspoon of salt, and 3 cups of water. Let the water come to a boil, then turn down to a simmer. 4. Cook, stirring occasionally, until the lentils begin to disintegrate. Keep an eye on the water level. If things begin to get too dry, add a splash of water. You want your end result to be a sort of porridge consistency, but at this stage you should err on the side of wetness. 5. When the dal is soft, add one small chopped tomato or equivalent amount of chopped canned tomatoes. If the dal is too loose at this point, you can turn the heat up a bit and cook it down to your desired consistency. Taste and adjust for salt if needed. Now, put some eggplant in the bottom of a bowl, and spoon dal over top until you can't see the eggplant any more. Put a few more pieces of eggplant on top of the dal, and if you happen to have some crispy fried onions in the house, as I always do -- I really like the Laxmi brand jug o' onions, available from Kalustyan's -- sprinkle some on top. Of course you can also fry your own, but I find that I simply cannot replicate the gorgeous light crispiness of the prepared kind. CRUNCH CRUNCH. I might make a side dish of some sort while I'm at it, if the hosts approve. For whatever reason, I find the idea of pasta at Thanksgiving a little dissonant, but after a lot of thought, I've come up with a baked pasta variation that pleases me for the purpose. The fact that it is called upon to present itself as an entrée, rather than just another meatless dish added a little extra challenge, I thought, as well as the fact that we're trying to avoid too much overlap in flavors from dish to dish. I'll tell you the whole story of the pasta when it's all made and I have pictures to go with the recipe -- for now I'll just say that it involves both caramelized onions and pistachios. Today's recipe is for one of the meals I made to carry us through to Thursday. I think that cooking for this week is a little bit extra fraught: I don't want to make anything that will wind up being redundant, or near-redundant, with the Big Meal, and yet here we are buying the very sorts of vegetables that lend themselves to that exact kind of treatment. One answer is to go for a cultural contrast; we'll be having something East Asian tonight, and at least one Indian dinner before the week is out. But there are a few odds and ends of our shopping that didn't inspire me in either of those directions, and this recipe is for them. The cultural provenance of this dish is a little bit this, a little bit that, but mostly, I think, Berkeley Hippie. It's also not particularly schmancy, what with the canned black beans and chili powder. It's still good, though! And leftovers, cooked down a bit further, make an excellent filling for (hippie) burritos or empanadas. Even though I love them, I will admit that lentils can be unromantic and drab. Not so the small, dark, and elegant French lentils (also known as Puy lentils) or the equally petite and glossy black Beluga lentils. These retain their shape and their chic dark color when cooked and are excellent in salads. The visual contrast with red pepper and bright green parsley is lovely as well, but what I like best about this salad is how simple it is to make and how good it tastes. Cook the lentils in at least three cups of salted water until cooked but not mushy. Drain and rinse briefly with cold water. In a large bowl combine the lentils and vegetables. Add the olive oil, vinegar, salt, pepper and parsley. Mix gently but so that everything is nicely coated. The corn will thaw quickly, chilling the salad a bit in the process. This would be good with feta or goat cheese, but it's also excellent just as it is. Chickpeas from a can are not particularly glamorous, but they are a faithful kitchen friend. They taste much better than most things that come from a can, and can be doctored in any number of ways to produce cheap and wholesome dishes suitable to any season of the year: chana masala, pasta e ceci, hummus, minestrone, in a garlicky puree, roasted with cumin, in a salad with olives and feta, in a summer vegetable stew, and on and on as long as tradition and invention do not fail you. I most often make chickpeas in one of their many delicious Indian preparations. 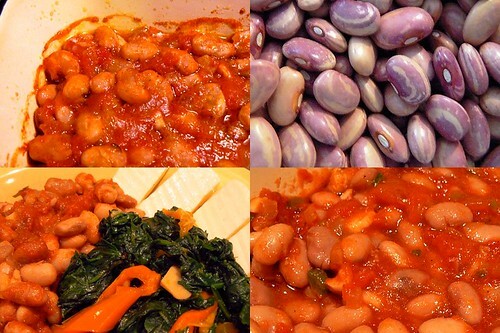 Today's recipe, though it shares several features with those dishes, is definitively Mediterranean--Catalan, specifically--and threatens to elbow batura chole out of its prime place in my kitchen rotation. The saffron, garlic, tomatoes, ground almonds, and lemon combine in a marvelous way. We had some hot, with chopped blanched turnip greens stirred in to make a one-dish supper, and some cold, with salad, for lunch. Both ways are excellent. This does take a bit of time to make, so it's a good choice for the weekend, and, as promised, the results only get better as the week goes on. I feel like a bit of a heel about it, but I've rewritten the recipe as I made it, for posterity here, even though my original source is already online and beautifully written, at The Traveler's Lunchbox. I just love it so much that it alarms me to think that I wouldn't have my own record of it, just in case. My alterations are minor, but I stand behind them. I used arugula instead of parsley, because that's what I had on hand, and its peppery taste was a fine complement to the others. I decided that I wanted a bit more lemon flavor than the lemon juice alone could provide, and didn't want to go on making the sauce thinner by adding more and more juice. If you feel the same way, a touch of lemon zest or lemon oil will do the trick. Just a little tip, from me to you: a handful of thick rolled oats (not instant!) is an excellent addition to soups involving lentils. Lately I have been making many pots of soup that combine many lentils -- brown lentils, little tiny dark green lentils, masoor dal (aka red lentils), toor dal, and urad dal -- with oatmeal. (Also with the usual other things: onions, garlic, carrots, cumin, tomato, and a splash of vinegar.) The oatmeal adds body, of course, and retains just enough integrity to provide the tiniest bit of chew. Very nice. For us at Laxmi Toor dal, Picking up each grain is akin to picking up a diamond from a mine. Only the best Toor produce is acquired through our in-house international trading house. It is subsequently checked at our laboratory before the processing stage. It is the sheer expertise to identify and consistently procure the best grains from around the world, which leads us to offer an unmatched assurance of superior taste and nourishment in each grain that we produce. Black bean couscous cakes I'd make them with quinoa, I think, and either the hash version, or with unvegan eggs to hold them together. Mini crustless tofu quiches Not much like a quiche, there, but that's okay by me. I think I find the prospect a great deal more appetising if I don't think of this as faux something else. "Golden tofu vegetable rounds," perhaps? Sounds like a nice thing to have around for lunches. Hare chane ki seekh (green chickpea kababs) Another nice thing to tuck into lunches, I'd think, and I have a bag of green chickpeas in the freezer. Upma (see also, or with oatmeal!) No farina in the house at the moment, or indeed ever to date, but that needn't stop me for long. A good venue also, I suspect, for onions from the bottomless jar of crispy fried Thai onions. UPDATE: Tonight I was inexplicably still hungry after a perfectly adequate dinner, so I made my own little version of Indira-of-Mahanandi's oatmeal upma, and it was fantastic, especially with mango and chile pickle. Mmm, so good. And certainly filling! I foresee that we will have this for breakfast in the future.